Top Notch is the exciting result of $55,000 Sandeen Upper Class crossed on HSF Victoria P30, who has had over $350,000 in offspring sales and reigns as the leading donor for Hecksels of Minnesota, and the producer of another successful donor phenomena, HSF Baby Doll W959. Sandeen Upper Class was valued at $55,000 for half interest, and comes from a cow family that is second to none. His dam, breed legacy, Donna 7386, commanded an impressive $140,000 selling to astute cattleman Nick Sloup of Nebraska. His powerhouse maternal grand dam brought an astounding $100,000. Top Notch is loaded with exceptional mass and performance in a moderate made easy-keeping package. 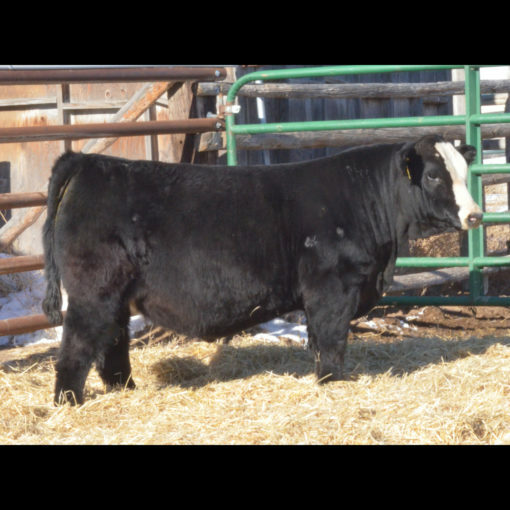 His width and massive rib shape afford him the ability to moderate cattle without moderating weaning weight. Top Notch is a breed changer.